As the automotive industry embraces software and connectivity to deliver innovative features and functionality, the code bases of in-vehicle systems have grown exponentially, sustained by increasingly complex software supply chains. The pace and magnitude of this change challenges the incumbent resources and processes that OEMs and their suppliers possess to test and harden these interconnected and often safety-critical systems. This paradigm, compounded by the evolving threat landscape and sophistication of cyber attackers, is elevating the level of risk associated with automotive software quality, security, and compliance. As demonstrated by recent vehicles hacks and the subsequent recalls and unwanted attention from regulators and mainstream media, insecure software poses a very real threat to the automotive industry. Join Chris Rommel of VDC Research and John Jacott of Synopsys’ Software Integrity Group as they explore the mounting software challenges faced by OEMs and their suppliers. 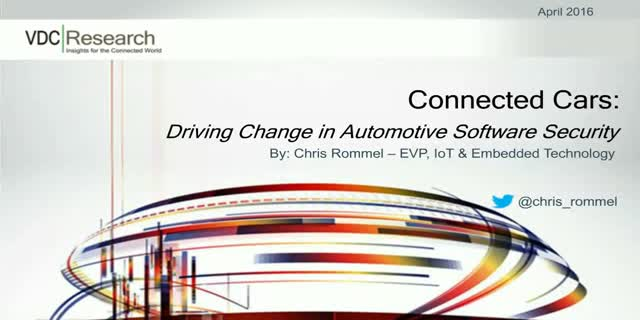 Learn how the automotive industry can adapt by leveraging existing solutions and best practices to drive down risk while maintaining agility and the innovative edge that modern technology affords.